About a year ago, when the lease was up on my last studio I decided it was time to make a move into something that was a little larger and would function more than just being a studio/office. I realized I needed a spot where I could handle everything under one roof, a space that could function as an art/design studio, gallery, office, and shop. We searched for weeks looking for a potential location but nothing seemed to match what we were looking for. Finally, after about a month we found her, unpacked the boxes and moved in. It was a raw space, so we felt the only way to section off the space would be to build a second story for the design studio/office above the gallery. After two months of building out the studio, here we are about to open our doors. ABV is the new HQ for all our creative projects. We look forward to utilizing the space to create and showcase our work and work of other artists in our circle. I have brought in a few friends to kick off the grand opening. I hope you can make it out! 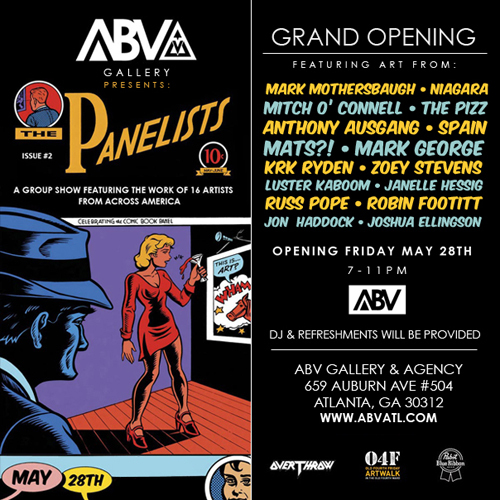 ABV Gallery Presents, "The Panelists"
A group show featuring the work of 16 Artists from across america.